Spiritual Healing is based on the understanding that we each have a "spiritual body," an energy field where imprints of trauma, both past and present, as well as unresolved issues and other "dense energies" reside and can block our well-being. Spiritual Healing, also known as Contact Healing, Shamanic or Hands on Healing, is common to all religions and has been known throughout time by all peoples, civilized or primitive. In religious or spiritual circles it takes the form of prayers to God. The incantations of the medicine man or shaman also fall within this meaning. During a Spiritual Healing session I create a "Sacred Space" and attune myself with high frequencies of light in order to become the receiver through whom spirit healing forces are channeled and passed on to you. My main function during a healing session is to assist you in manifesting your own self healing potential. In many cases this healing modality promotes positive shifts in the energy field and will alleviate discomfort, pain or symptoms. In the course of a lifetime, it is inevitable that one will suffer emotional or physical trauma, it is not uncommon that one part of oneself may step aside to survive the experience. This separation from one's life force is called "soul loss." Sometimes also we come to a crossroad in our lives and are in need of support from the spiritual world to see what our next step is, what is the blueprint of our lives. The Shamanic Journey to the soul is a sacred journey to the Source, it is a peaceful way of reconnecting with your soul and higher realms of consciousness. It is a warm, wholesome, caring way to nurture your spirit and to reconnect with the vastness that we all are. During a Shamanic Journey to the soul, I’ll travel to the world of spirit on your behalf to retrieve information and energies for the healing of your personal request. You also have the choice to be guided during the journey and travel with me to find the answers to your specific questions or visit with the afterlife. A session may be directed into Soul Retrieval, healing, Wisdom Gathering, vision quest, Ancestral Healing , or a combination of these and other energetic healing work. Each session is followed by a private time of integration and honoring of the experience. This Awakening the Soul healing process has been many years in the making. 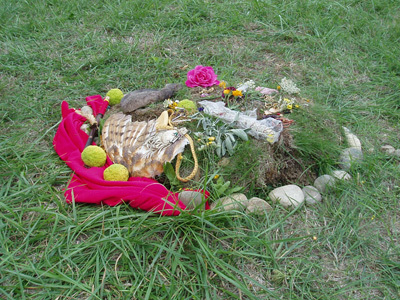 The tools I use to access the parts of your life that are in need of healing are derived from an earth-centered practice of shamanism, including my own Corsican shamanic background. It also integrates what I have learned by personal experience and the many years I have dedicated to working with the living, the dying, and the world of spirits. These tools have been created to effectively open a direct pathway to the world of Spirit in order for you to reestablish a conscious connection with your own multi-dimentional nature and find the true meaning and purpose of your life. Allow one hour and a half of your time when making a reservation. You can receive the benefits of Spiritual Healing no matter were you live. Both distant and in-person are available and are equally effective, because healing is performed with the help of Spirit. In Distant Healing my function is to be the communicative link between the absent patient and the healing source as the patient's spirit self acts as the transformer and receiver of healing forces. For Distant Healing, I will need a photograph along with your Name, Age, State/County, and what the healing is for. Please be advised that all photographs will only be sent back to you if you send a self-addressed stamped envelope. Spiritual Healing is also available our for our animals friends and beloved pets. Payment of check, cash or credit card by PayPal is required in advance, prior to the session. Please look at Josiane Antonette's schedule of appearances in your town.